Good morning, Friends! Monday is here once again! But the kiddos around here don't mind as they have another week of spring break! Woohoo! And today looks to be a much better day weather wise than yesterday! Wow! We had wind gusts of 62 mph!! It did rain a little so that helped to keep the dust down a bit. Crazy weather! March is definitely going out like a lion around these parts! Today's card was inspired by one I saw on the Hero Arts website. 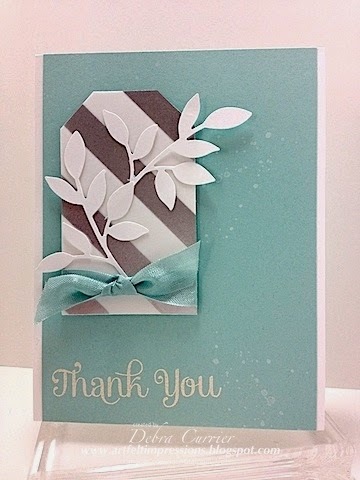 I thought our new designer vellum would work great and I do like how this one turned out! Thanks for stopping by! 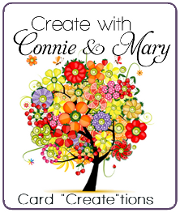 Don't forget that the Create with Connie and Mary Card "Create"tions has started! It's not too late to sign up and still be able to see and download all the projects that have been shown! Only $19.95!! I hope to see you there!! The Create with Connie and Mary Card Create-tions session runs from March 30 thru April 19! This is So Beautiful. The colors, the balance, the details. I love it!